As a beginner, selecting the right products will determine how your path to making art progresses. Picking pencils that are suitable for beginners is a must. 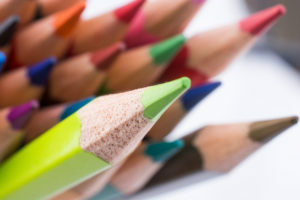 Regardless of what you’ve heard or believed in the past, picking out the right colored pencils is more complex than just buying a random set and hoping for the best. This is especially true if you have hopes of getting good at it. What you will soon learn is that all colored pencils are created differently. If you don’t plan to make art with colored pencils into a regular practice, as basic set is fine, but for those seeking to make quality art, you should dig a bit deeper. The best trait to look for as a beginner is workability in your pencils. As a newbie, you’ll want to find something suited for practicing with. As long as the tools you choose are made well and fit for basic techniques, it’s a great start. Keep in mind that softer leads mean easier blending, but usually cost more. Although you will find premium grade pencils like this easier to work with, make sure you have pressure control down before upgrading to them. Seek out pencils that have good give but save the soft cores for later.